Q: Hi! I have a large number of PDF files in my computer, and I wanna have them batch converted to Flash magazine quickly and conveniently. Can Page Turning Professional for Office do this for me? A: Page Turning Pro for Office is powerful flash magazine creation software, can not only convert MS Office files and images to flip book, also turn popular PDF files into wonderful flipbook. 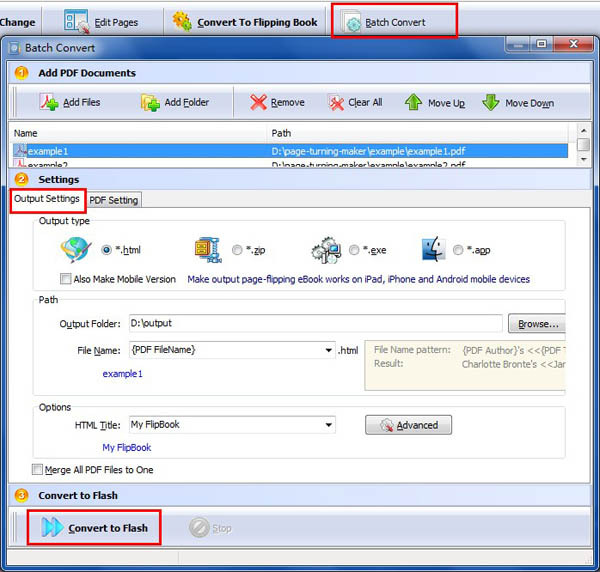 Moreover, it provides a convenient way for users to batch convert lots of PDF files. It is simple to apply the batch conversion mode of Page Turning Pro for Office. In main screen, choose “Batch Convert”option to initiate batch mode, then you can import any PDF files and define the output options including output type and path. At last, click “Convert to Flash”button to start conversion.